Hello all! I wanted to upload a couple of my new favourite games for developing fluency with the facts. Once a strategy for recalling the facts has been learned, these games will help students to apply those strategies more fluently. It takes time and practice to master the facts – practice with the strategies and then practice using the strategies to recall the facts themselves… We all know the facts are critical to success with math. How we master them matters too. So, first is the game from BEAM called Add Nines. It depends on knowing the strategy of “compensation”. Compensation is an algebraic idea, in which we “take from one number and give to the other”. 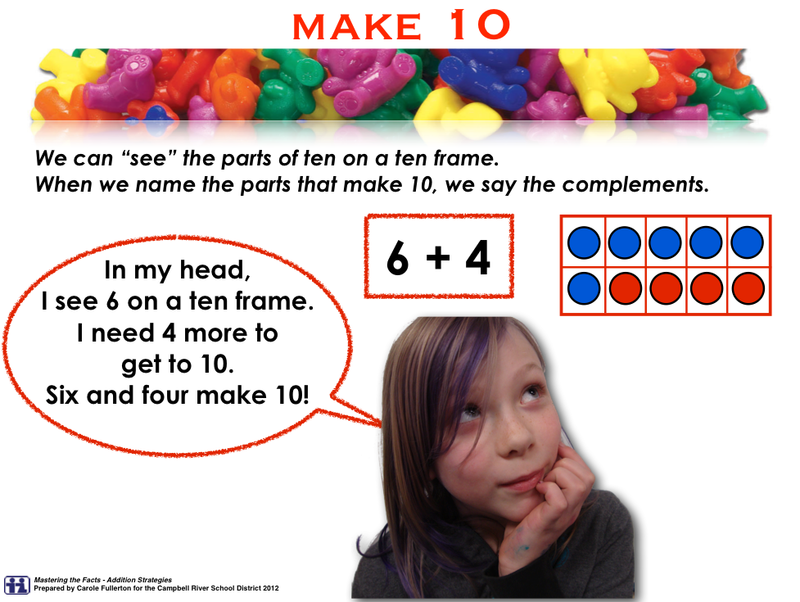 This strategy works because in every case we make a ten (or another round number). If we add 9 and 7, then we can take 1 from the 7 and give it to the nine, to make 10 and 6. And ten and 6 is easy… 16! The next game is for mastering the 2 x facts and the 4 x facts. It’s my own (adapted from another BEAM game) but with numbers accessible to students learning these facts in 4th and 5th grade. It’s called Double or Double-Double. The goal of the game is to practice the strategy of doubling (multiplying by 2) or “double-doubling” (multiplying by four). I hope these games prove fun for you and your children… More than that, I hope they will help your kids to truly master these important facts!